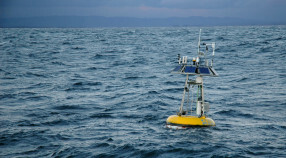 We study the biology and chemistry of the ocean in relation to global change. How climate, ocean physics, marine chemistry, and ocean ecosystems co-vary on global to meso scales, and how this affects the temporal and spatial variability in phytoplankton biomass, composition and production. 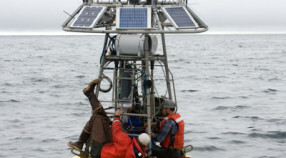 What are the mean and fluctuating components of phytoplankton primary production, biomass and species composition on time scales ranging from days to years. What are the physical, chemical and biological processes responsible for the mean and fluctuating components. What controls primary production and phytoplankton growth rates. 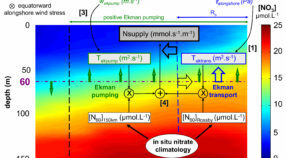 What is the role of meso and macrozooplankton in coastal upwelling systems. What is the fate of primary production? 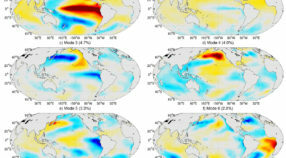 What are the biological consequences of El Niño. 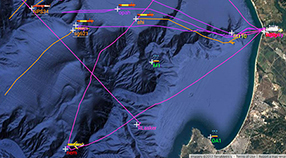 Focusing on the upper water column, we use instrumentation and systems for long-term ocean observing, such as satellite remote sensing, instrumented moorings and drifters, autonomous vehicles, and ships. 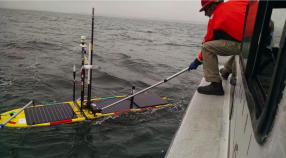 Moorings float above the seafloor and can constantly take a variety of measurements, giving researchers a clear picture of oceanographic conditions. 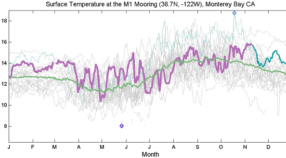 Summary graphs from the Monterey Bay Time Series (MBTS) CTD cruises. Includes physical, chemical, and biological samples. Updated quarterly. 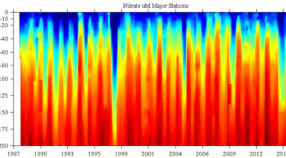 Climatology graphs of sea temperature (0m, 60m 100m), ISUS nitrate, HS Chlorophyll, and upwelling indices from 1990 to the present. Updated daily. A brief survey of current data from the M1 mooring in graphical representation. Updated daily. 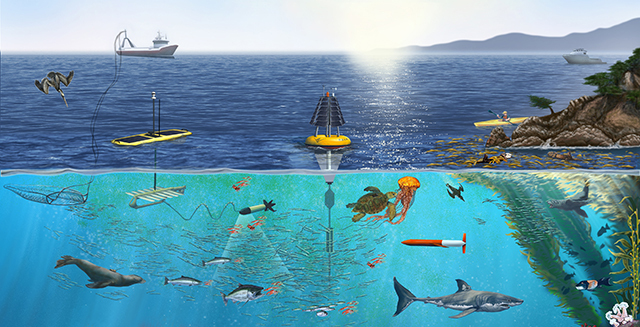 Our lab uses moorings, gliders, AUVs, and CTD measurements to study fundamental oceanographic phenomena. May 30, 2018 – Cranes are integral to MBARI’s marine operations, including moving massive pieces of equipment on and off ships.